Service is a very important feature for us. Starting with the development, we work together side to side with our clients until the product is manufactured. We offer individual solutions for your projects. Our offer includes the project management and further assistance in the development of details. We deliver solutions for complete projects as well as solutions for parts of your project, just depending on your wishes and needs. We support you with the solution. Our offer includes the project management as well as the development of details. We offer complete solutions to you or solutions for parts of you projects, depending on your wishes and needs. The construction of all the development tasks will be undertaken under consideration of the production instalment. A sense for costs concerning the product as well as delivering the product within time is our main priority. Our service to you contains pure hardware as well as mixed hardware and software solutions in the electronical development, reaching from the pure sound technology up to the embedded solutions on the basis of a micro controller. Concerning the sound technology, our offer reaches from analogue technical and digital technology up to client specific solutions like ICs as FPGA and ASIC. We develop the necessary software for the usage of microprocessors. It belongs to our tasks to take the EMV-Line into consideration for the development together with the relating regulations and standards as well as implementation of the development under consideration of the later approval of the product. Naturally we design prototypes for tests and trials within the development time. Normally electronical development goes together with the development of the instruments; therefore Ruthardt Electronic knows how to cooperate with your team of constructors. An excellent tuning of electro mechanic and electronic is the best basis for a reasonable product and the cornerstone for a successful marketing. Beneath the high level of functionality, the design in consideration of the production requirements plays an important role in the development of the products. Therefore our own production offers the basis for the technological information reflux. Independent of the form, strength and quantity of the PCBs, we develop layouts including all the necessary combining and fixing elements exactly according to your requirements for the product. To ensure small quantities and small PCBs, we are able to work out structures up to the precision mechanics with a high level of packing density. The consideration of the EMV policy within the development and the concerning regulations and standards is also one of our tasks as well as the implementation of the development under consideration of the regulations concerning the approval for the product later on. As we take a look on the production costs, we also consider, that the layout of the PCB plays a major role for the costs for the PCB unit and the placements. To lower the costs on a minimum we trust on the experience of our highly qualified PCB-layout-specialist and on the information reflux from our own placement department. Those named policies and the concerning standards are part of our development standard for a long time already and therefore the compatibleness with the European standards can be assured. The supervision of our products is done by an institute (TÜV-Rheinland) according to the standard DIN EN 45001. The independent assigned technical and professional competence as well as the integrity of this institute is a requirement of our quality management. The supervision reports are accepted within Europe, according to the accreditation measures and can be looked at and demanded at any time. Therefore the EMV tests are for instance made according to the standards EN50081 or EN50082 and the compatibility is objectively proved. In the range of the European policies the EMV policy has a special meaning. The policy for the first time defines the electromagnetic compatibleness as necessary product feature in a regulatory policy. Not only the influence to other instruments through disturbances can be punished as regulatory violation, but also the missing immunity against disturbances are seen as product mistake, that may lead to a withdrawal from the market. The only exemption for the implementation on the market is the export in those countries where the EMV policy has no influence, or the usage of the product as spare part for the restart of existing instalments. There is no need for the compatibleness declaration or for a CE-labelling for all those products, which are not obtainable in the open market, non-recoverable autonomically and which are exclusively build for the instalment in the industry or other professional usage. Those are for example all the OEM-assemblies, machine controls or controller boards, which are exclusively delivered to companies for the processing (installation into bigger systems) and therefore are not obtainable on the open market. In this case the processor / the producer of the final product is responsible for the compliance of the EMV regulations. But naturally he will ensure, that his supplier does not produce a radiating PCB unit for example for the installation into a copy machine. Each developer of an electronic circuit, that later on will be installed and used or will be market commercially, has to consider in the first development the problem of the EMV. Without realising it physically, the electromagnetic radiation is a fix part of the our day to day life. Radio, television, mobile phones are only three of the possible usages, which use electromagnetic radiation. As useful this radiation on one hand may be as dangerous it may be on the other side, as soon as they disturb necessary, essential instruments. Therefore the use of mobile phones in hospitals or in aeroplanes is absolutely forbidden. To ensure the compliance of the regulations and standards, generally a special technical EMV measure is used, that differs from the general measure instruments of all day products. Therefore today an extensive technical know-how concerning the high frequency radiation and the disturbance radiation features of components and circuits as well as a completely equipped instalment for measures is necessary for an EMV compatible circuit design. The development of hardware today underlies an enormous pressure of time and costs. Mistakes in the design and missing know-how in the EMV technology delay the launch on the market for the product and therefore raise the costs for the development. The earlier the functionality and the electromagnetic compatibility are tested, the earlier the product can be launched on the fast moving market. The labelling with the CE-sign was launched as an important instrument for the performance of the open market within the European single market. By implementation of the CE-sign on the product, the producer assures that the product is compatible to all the existing regulations within the European Union. The EMV policy defines limits for all the electric instruments. That concerns as well the radiation, which is send by the instrument as well as the radiation the instrument accepts without any disturbances. That for example may prevent that a television and a PC may disturb each other. CE is the short form for Conformitee Europeen (European standards). Since 1st January 1996 the CE-sign has to be installed on each electric instrument obviously. With this label the producer or seller of the product declares that the product is conform with the European regulations. Especially this means the EMV (electromagnetic compatibility). The weakness: Each producer of electronic instrument may declare the conformity of his products with CE-regulations without been forced to test them. They will only have problems as soon as someone finds out that the CE-Standard is not fulfilled. For instance the raising rates of electronic installments in the automobile industry and the fast raising PC and EDV density in offices and at home may cause further reason for discussion concerning the EMV. Producer and naturally especially the developer of electronic assemblies, not only for the reason of cost sensibility, have to own a founded knowledge about the noise immunity and which disturbances may be caused by their developments. At this point the basic knowledge focuses on topics such as: high frequency technology, suppression technology, high voltage and low voltage technology concerning the power supply. Therefore measurements along the development as well as the optimal use of the knowledge of testing institutes are the right combination for the assurance of the quality. The importance of the conformity with all the regulations of the latest version of the EMVG – the law about the electromagnetic compatibility of instruments, alone can be realized with the definition of an instrument according to the EMVG. According to this definition, instruments are all electronical and electrical devices, installations, systems or cards, that contain electronical or electrical components such as: computer, radio and television receiver, industrial equipment, mobile instruments, IT instruments, domestic appliances, electronical domestic equipment, telecommunication networks and instruments of telecommunication as well as all commercial, mobile radios and mobile phones. You as a client require to be delivered exclusively with functional instruments. We assure that to you, by extensive measures within the processes of manufacturing and by our testing department. 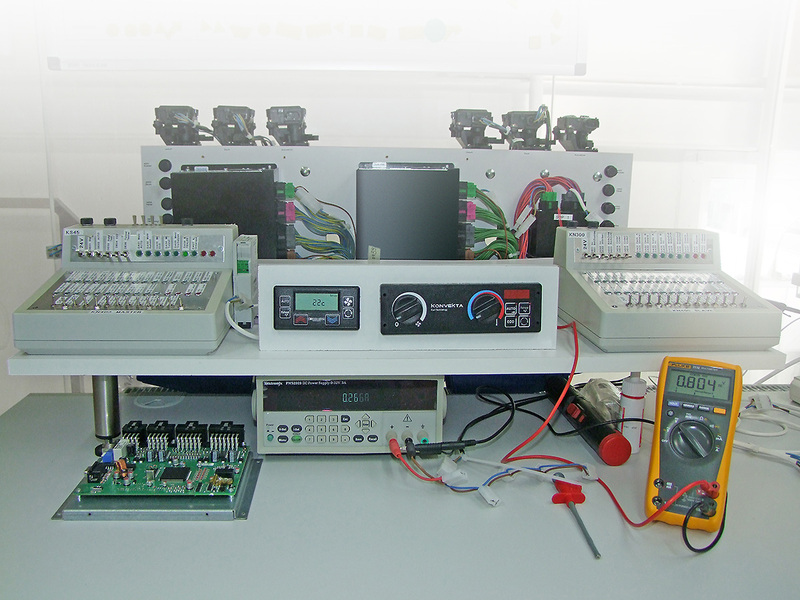 Before the fitting of the PCBs, we define together with you the testing strategy and the testing characteristics. Our management of test tools does the implementation, which is responsible for the development and construction of the test tools and testing adapters. To take testing measures means to us, to rule and to supervise in the range of the quality assurance the fitting of the PCBs and the case assembly. According to the requirements, the PCBs are tested in so-called in circuit and functional tests after been fitted and before they are assembled. Finished assemblies such as fitted single circuit units or finished products are 100% tested on the functionality before leaving our house. Therefore you can resign extensive tests in the receipt of goods and you save a lot of costs and time. Normally a fitted PCB is no sellable product itself. Therefore the fitted PCB has to be implemented in a case, probably together with further components. Labeling of the packing according to the requirements of the client.